We have prepared for you an article about permanent residence for foreigners in the Czech Republic. Within the article we would like to inform you about the process of application for permanent residence so that you can obtain residence card for foreigners. Who can obtain permanent residence in the Czech Republic? For application can ask citizens of European Union or third country citizens. Approval of permanent residence is decided by Ministry of Interior in the Czech Republic. An applicant has to fulfill application personally and then pass the appropriate form to the ministry office. With the application form has to be also attached necessary documents, which has to be always original or officially certified copies. All these documents except of your passport has to be written in the Czech language or officially translated to the Czech language. The application for permanent residence has to be always passed personally. You are a family member of EU citizen (you are also EU citizen), who has already permanent residence here. Then you are not obliged to fulfill five years of continuous residence but only two years. A citizen from the European Union, who requests for permanent residence in the Czech Republic has to fulfill 5 years of continuous residence in the Czech Republic. For citizen or citizen from third country, who is family member of other citizen from EU is necessary to fulfill this condition only for 2 years. 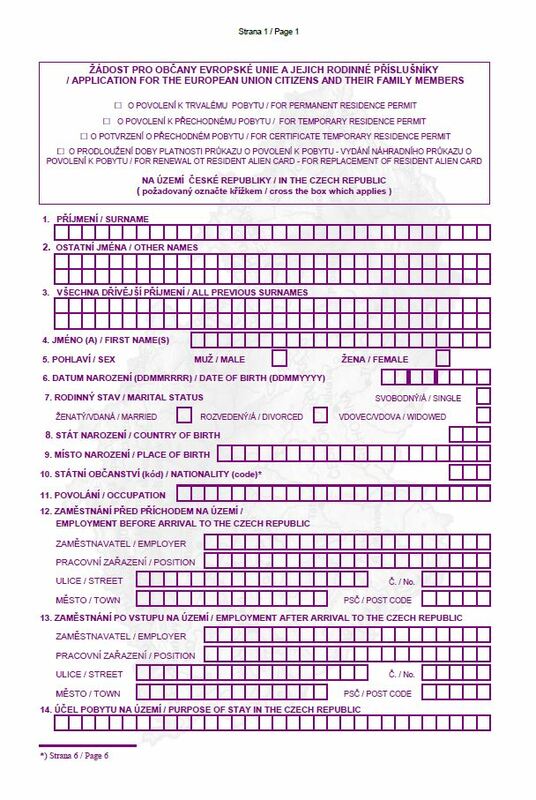 Document which confirm 5 years of continuous residency in the territory of the Czech Republic or 2 years if you are family member of EU citizen. The application for permanent residence must EU citizen pass to the Ministry of Interior of the Czech Republic to appropriate ministry office. Usually to the ministry office where you have announced residency. 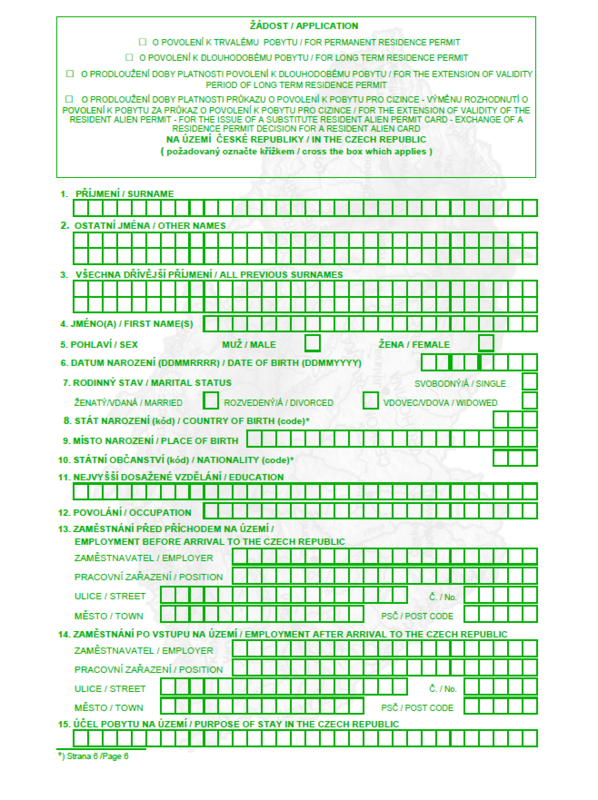 Application form for EU citizen or their family members can be downloaded here. If you are citizen of state which is not member of European Union then you have quite similar conditions as a citizen of EU. The application for permanent residence can be passed after five years of continuous residency in the territory of the Czech Republic. If you are family member of EU citizen who already has permanent residence and you are not member of EU state then you can request for permanent residence after two years of continuous residency in the Czech Republic but you have to proof that you are in family membership longer than one year. A foreigner who is not family member of other citizen of EU has to pass the application to the ministry of interior office according to his place of residence. The application for third country citizens can be downloaded here. Here are the exemptions which can only Ministry of Interior issues due to unique reasons. You have been conferred of international defense. If your application for permanent residence is positive, you will be called by worker of Ministry of Interior. He will tell you term of assumption your permanent residence card. In case he will not be able to contact you per phone then you will receive written appeal to come appear. By the day of obtaining permanent residence you will be automatically included to public health service. 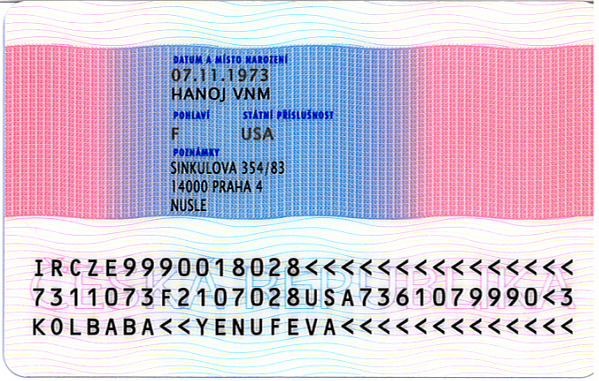 As a permanent residence holder you will have same duties as a citizen of the Czech Republic, which will be announced you in every office of Public insurance company – VZP (Všeobecná zdravotní pojišťovna). Permanent residence card is issued on 10 years after that it is possible to prolong. Extension can be done more times. Card is issued as a separate proof with photography. It serves as a proof of indentity. 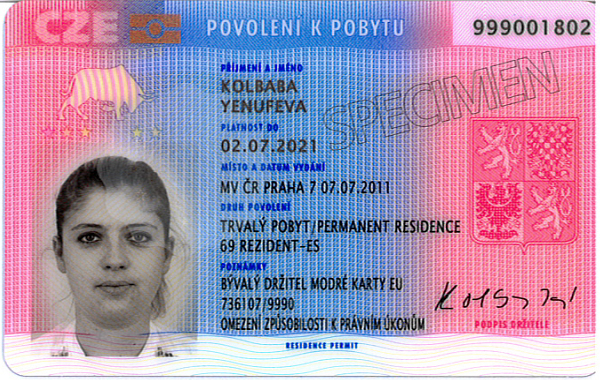 Extending the validity card in the Czech Republic is issued in appropriate office of Ministry of Interior. In case of late extension you can obtain penalty. New biometric card is not issued immediately. For withdrawal of biometric permanent card you will be contacted. By withdrawal of a new biometric card you will need to pay administrative charge, which is 2500,- Czech Crowns – The payment is done by revenue stamps, which can be bought in the office. What to do if mine application is denied? If your application is denied, you will receive notification about it. Against the notification is possible to send an argument from 15 days from date of delivery. The argument can be passed personally or can be sent to the appropriate office of Ministry of Interior. If your argument will be denied again, you can send another argument which will be judged by Commission for deciding of foreigners residency, which will enquire into circumstances.